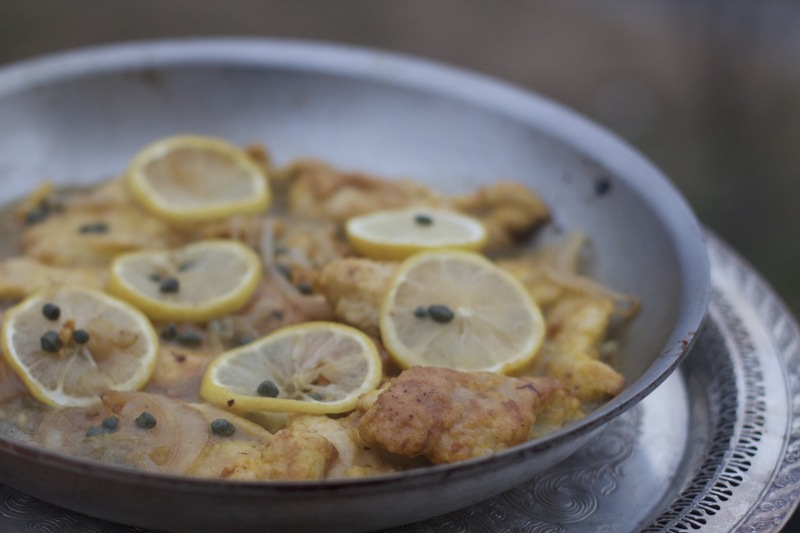 I’m excited about this lemon chicken recipe, so much so that I can tell you with all honesty that I have prepared breaded lemon chicken with capers six times in the last six weeks. I don’t ever do that, but this is one of those recipes that might become a signature dish, because it’s a dish just about everyone loves, including kids. Breaded chicken might seem old school, but don’t let the word “breaded” fool you. When you dip in egg and flour and egg again, something magical happens to a plain, ordinary chicken breast. It wears a coat that can take a sauce, such as a lemony caper sauce (which you can feel free to shoot a little wine into). This is a counter-intuitive dish, in that you shower it with a somewhat thickened broth which makes you think it’s going to go soggy, but it doesn’t. As it bakes in the oven over a foundation of lemon slices, the broth turns to a rich sauce and the dish becomes quite special. Maybe I’m slightly partial, because in the making the Einkorn Cookbook, I helped to test this recipe. While it’s not a flour-heavy dish, like some of the other choices in the book such as the one-pot baked bread (that I’ve made twice) or the waffles, pancakes or muffins that I can’t wait to try, it still requires flour to make it the way Shanna (one of the authors) remembers it from her childhood. You might be familiar with Shanna & Tim Mallon from Food Loves Writing. If you love coming here, you’ll really love going there. Shanna and Tim put beauty into healthy food, from beginning to end, and I could eat at their house every single night, even leftovers. They think through their food choices, not just for health, but for full enjoyment, the aesthetic, the aroma, the taste and then importantly, how that food makes them feel. They care about food sources, as do I. They research food in the same nerdy way, and they intentionally cook for health and for enjoyment, including Einkorn chocolate chip cookies here. I first learned about Einkorn a few years ago, and I’ve became very curious as to why this is the next new wheat, which is ironic, because it’s actually the world’s most ancient wheat in existence. I know I often talk about going grain free, but the reality of that is I can only do that about 4 or 5 days a week. And, the reason to give it up is to fight off inflammation caused by intestinal distress of over processed wheat. I wanted to know, is there a way to enjoy wheat without the freak out? Perhaps, for many people, the option is Einkorn flour. I make no promises about health reactions, but you can decide for yourself, by your own reaction. Low in gluten, it is more easily digested and doesn’t cause the intestinal problems some people have with wheat. It’s the world’s most ancient wheat and is not hybridized. Every other wheat has been altered to be more durable, more disease resistant, including the healthier wheats, but it’s all in degrees. What this means for you, is that it does the least amount of harm to your intestinal environment, making it easier to digest, often suitable for people with gluten sensitivities. It’s also more nutritious. Cook and bake using the same amounts as all-purpose flour recipes, keeping in mind that there is a lower gluten content in Einkorn flour. I’ve made my famous biscuits with Einkorn and they were great (recipe coming). Einkorn flour opens up an array of recipes that are better when breaded, like this buttermilk fried chicken, but in the meantime, I’m going to enjoy this breaded lemon caper chicken one more time. I made it here and even did a video that is still being edited. This looks so good! I would have never come up with this recipe on my own, yet it is always fun to try something new. It looks fabulous Angela, you killed it–thanks for posting! You’re welcome Tim. I love this dish. This looks delicious! I love anything with capers! This doesn’t look like a dish that my family would eat, but I am glad your family likes it. Sounds delicious! I’m always looking for new chicken recipes. 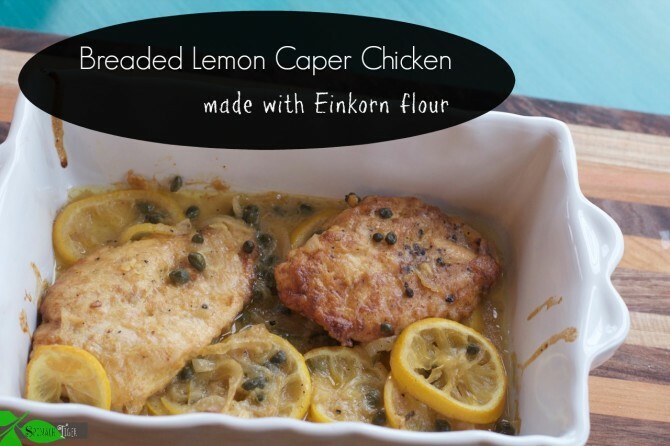 I love the addition of capers with the lemon – I bet it tastes SO good! 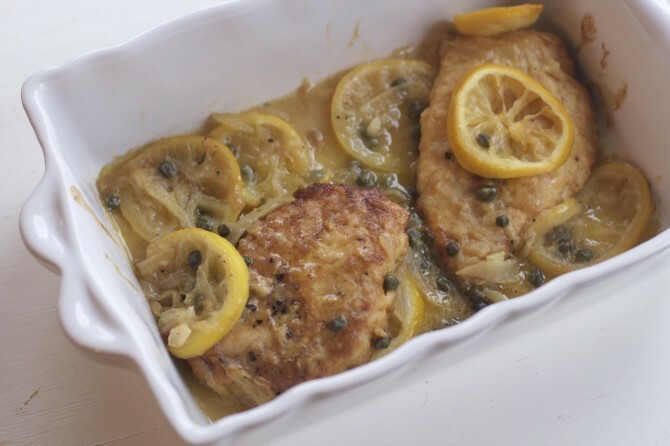 I’m a sucker for anything with lemon and capers, and this looks absolutely delicious! I’ve never heard about einkorn flour before, but I’m definitely going to check it out now. Mmmm.. lemon chicken sounds so good! I have seen a lot of great recipes posted today.. I think I need to up my “supper game”! Angela, dear, any dish that you’ve made 6 times in 6 weeks are considering in the running as a signature dish HAS to be good! I would love to try making this! Thanks, Susan. I’m almost ready to make it again. Thanks so much, Angela! We just made this last week again and I swear every time it’s like I’m a kid again. So comforting and savory and mmmm. Thanks again for your help with testing it, too! A scrumptious looking dish! I really like that combo.